My Grandma Rose is so special to my family and me. 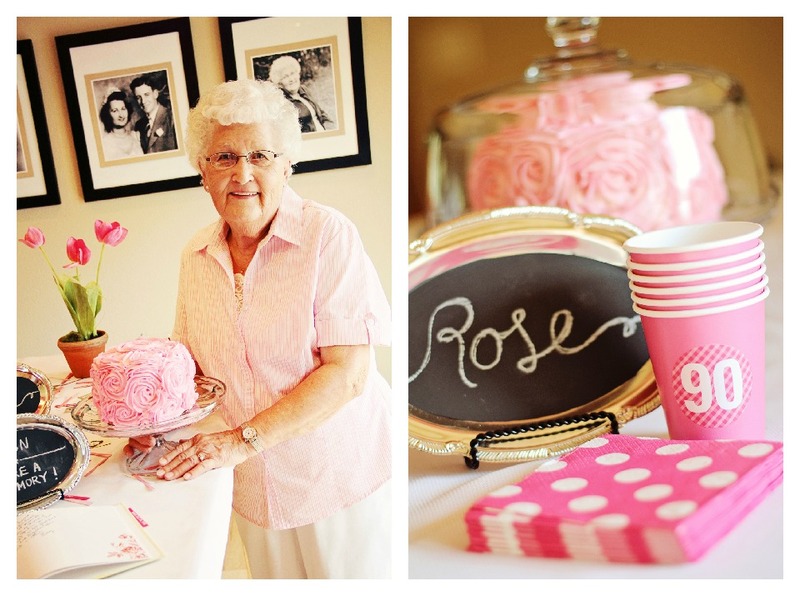 Turning 90 years old is quite the milestone, and we wanted to make her birthday party very special and memorable—not only for her, but for the guests! All of our birthday party ideas started with the invite. I was unsure which card I wanted to use and was tossing around several ideas, including Postal Delivery Invitation Postcard, or repurposing our Lasting Introduction birth announcement or Circles of Celebration trifold party invitations, the two-sided tri-fold was perfect for a 90th birthday party invitation! I was able to share a timeline, showcasing the highlights of Grandma’s 90 years of happiness! To make these invites stick out in the mailbox, I used Tying the Knot Address Labels in hot pink to seal it shut. I received a lot of compliments about the invite. One of Grandma’s friends was so excited that she said she had been showing everybody and was going to take it to coffee and show all of her friends! She said it was the most unique invite she had ever received. Once the invite was ordered, I got to work on planning the party and making the decorations. I wanted the guests to leave with a remembrance of Grandma Rose, so I made little photo magnets using the same photos I used on the invite. Then I packaged them using clear bags and stapling Cupcake Love Kids Stationery and Looking Linear Confetti to the bags. 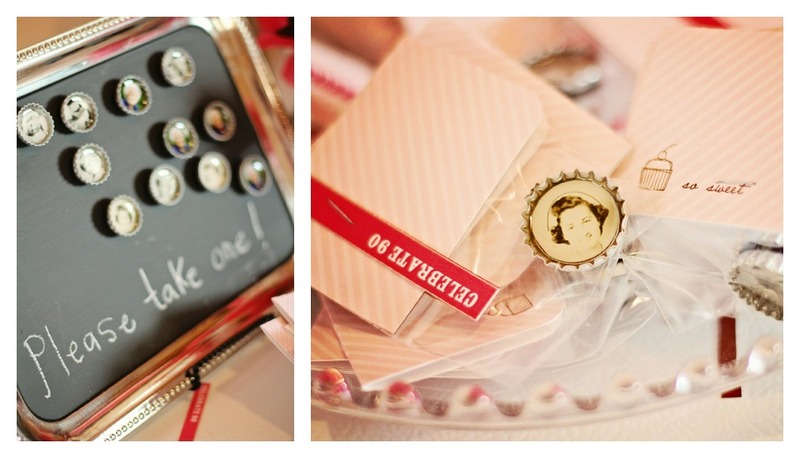 It was a fun token for the guests to take home and put on their fridge in honor of Grandma Rose. I bought basic pink paper cups and dressed them up with Pear Tree’s Round Gingham Favor Stickers, personalized with a big 90! Then I recycled some old greetings cards I’d saved by cutting out circles and sewing them together to add some more bright decorations around the house. My favorite part was sprinkling the Looking Linear Confetti on the tables. My Aunts and Uncles collected the photo confetti and placed them in their wallets as a little keepsake from the party. 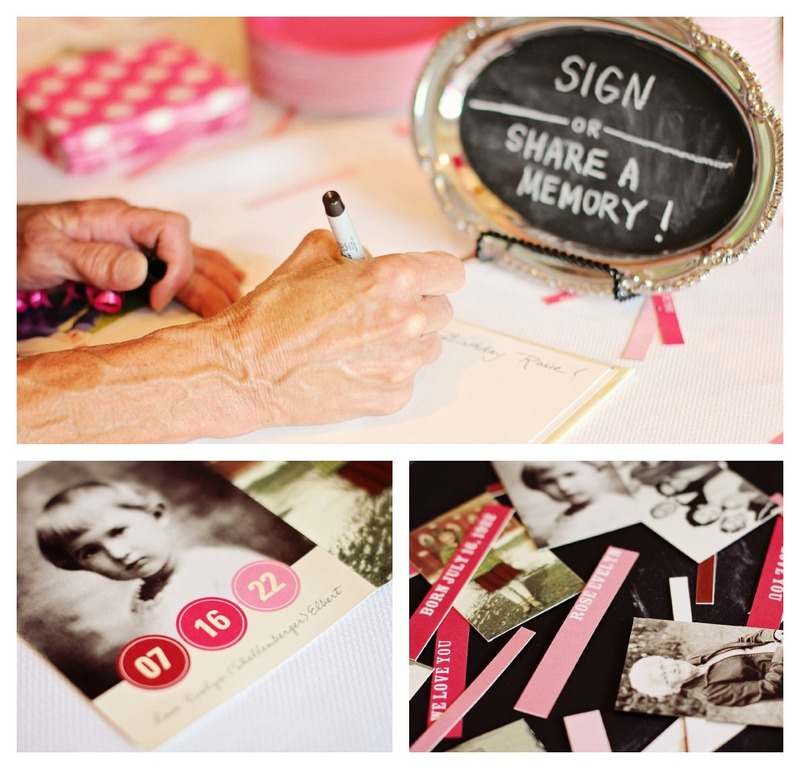 We also created a book for friends and family to sign or to share a memory, which Grandma Rose got to take home as a keepsake. I made little chalkboards out of some old platters and chalkboard paint, and used one to prompt guests to sign the book. Overall, I think the party was a huge success. Grandma enjoyed her day completely, visiting with family and friends. My next project is a 1st birthday party for our son, Alex. I’m sure the guest list will be a lot shorter for his party, but it should be just as much fun to plan! ← PreviousHappy National Aviation Day! Thank you, Kim! Glad you liked the party 🙂 The fluffy decorations are Tissue Poms. We have a great DIY tutorial to help guide you: http://youtu.be/2xX_6nKljP8 (but you can make it circular or any shape you would like). I absolutely LOVE the invite! 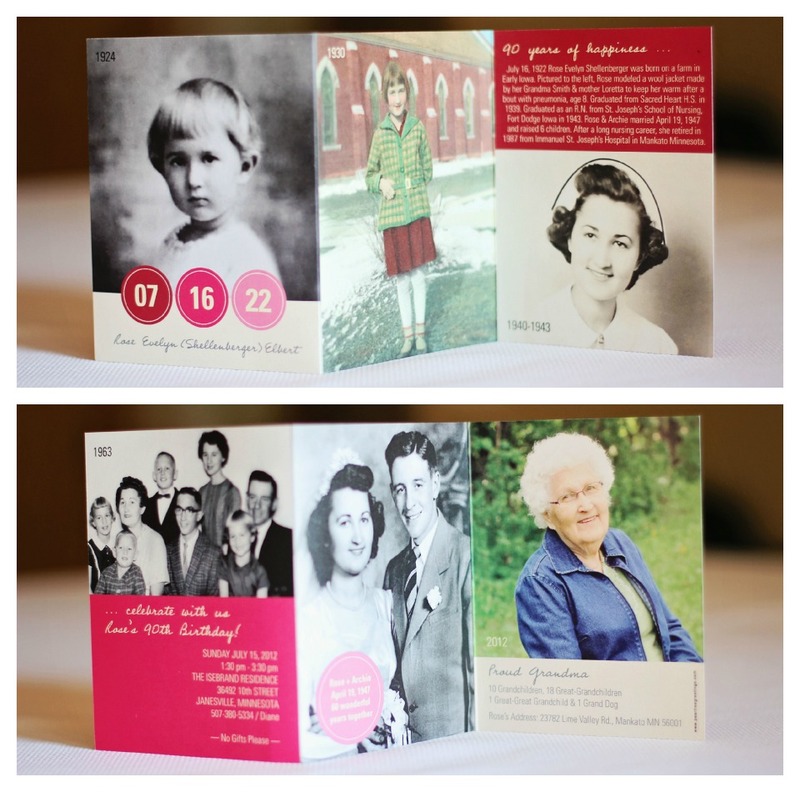 I’m planning my grandmother’s 90th and would love to do a similar invitation. I looked on peargreetings.com and tried to replicate yours, but it won’t let me customize it like you did (timeline dates, adding a pic above the wording). Do you have any suggestions? Thanks in advanced! Hi Laura, so happy to hear you love this invitation. We have since created one just like the one shown above. Please use this link and you will be able to personalize all the details: http://www.peartreegreetings.com/Stationery/Party-Invitations/2775-17693FC-Circles-of-Celebration–Trifold-Party-Invitations.pro Thank you!! Looks like it was a great party! I am working on planning Grandma’s 90th Birthday celebration. Such a wonderful event! Question-were your platters silver or glass? Did you have to do anything special to “prep” them before you painted them? Hi Kiley, that is so great! Happy 90th to your grandma as well! The platters were silver that were found at a local thrift store. Nothing was done to the platters before painting. Michelle said she used 2-3 coats of chalkboard paint and that was it. It was pretty simple. 🙂 Hope that helps. Enjoy planning, thank you! I like the magnet idea! I’m new to this.. How do you get the pictures so perfect to it in the caps? Hi Patricia, great question! For the magnet bottle caps, Michelle painted the bottle caps. She then printed out the photo so it was a “real photograph”, punched the photos out with a circle punch she had bought at a craft store, and then filled it with Epoxy Resin. She let it dry and then super glued a very small magnet on the back. They were a hit with the guests! Hope that helps – thank you!! Thank you so much for your valuable party ideas.